Recombinant fragment, corresponding to a region within amino acids 46-317 of Human FLJ12644 (UniProt: Q9BS31). 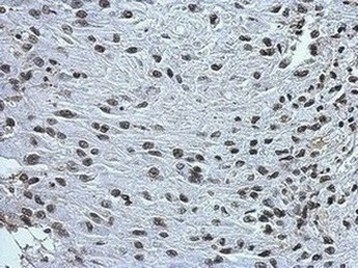 H1299, HCT116 and MCF7 whole cell lysates; Human U373 xenograft tissue. Our Abpromise guarantee covers the use of ab155023 in the following tested applications. 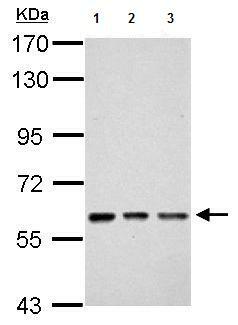 Transcriptional repressor. Regulator of transcriptional factor complexes and may suppress SRE and AP-1 transcription activities mediated by growth factor signaling pathways. Highly expressed in heart, skeletal muscle, and brain. Lower expression in liver, lung, kidney, pancreas and placenta. Expressed in fetal heart, brain, placenta, lung, liver, skeletal muscle, kidney, and pancreas. The KRAB domain is required for transcriptional repression. Immunohistochemical analysis of paraffin-embedded Human U373 xenograft tissue labeling FLJ12644 with ab155023 at 1/500 dilution. ab155023 has not yet been referenced specifically in any publications. Publishing research using ab155023? Please let us know so that we can cite the reference in this datasheet. There are currently no Customer reviews or Questions for ab155023.